As the premier community news publication in South Hillsborough County, The News of Sun City Center & South County reaches more than 30,000 homes in Sun City Center, Kings Point, Valencia Lakes, Riverview, Ruskin, and Wimauma each month through “Every Door Direct Mail” delivered by the U. S. Postal Service. Residents read The News each and every month because of our feature stories, as well as popular sections such as SCC Bulletin, Community, Performing Arts, South County Events, Sports, Military News, and Faith & Service. This positive, community-focused content ensures that people read each publication cover to cover and refer back to it multiple times throughout the month. Our readers appreciate learning about their community, not the next town over or the big city at the other end of the freeway. They appreciate that our stories are about their friends and their neighbors, about their clubs and groups, and their favorite hobbies. About where they play, where they work, and where they worship. Stories about what’s going on in their world and the best tools to help them to connect to it. That’s what our readers tell us. That’s why they keep each issue until the next one is placed in their mailbox. And that’s why we get so many requests for additional copies and so many hits on our website, every single month. How can we be so certain that more than 30,000 homes and businesses will receive your message each and every month? Because nothing stops the United States Postal Service. The USPS is the ONLY service we trust to get our papers delivered on time, every time. 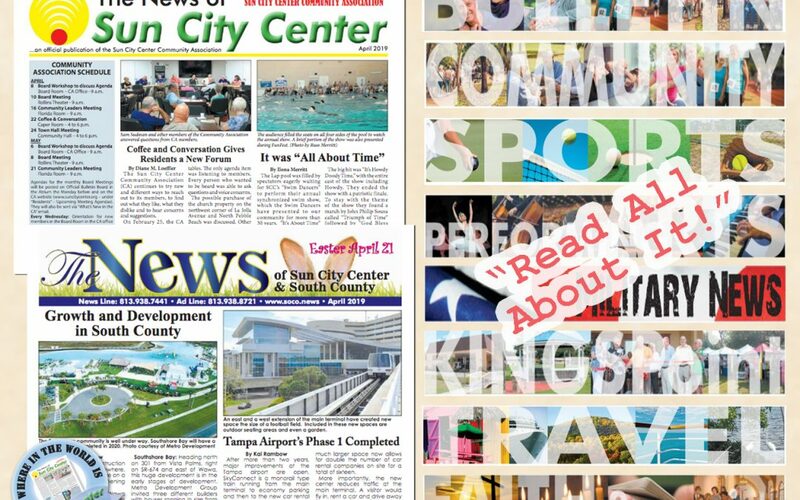 If you want to do business with the wonderful residents of Sun City Center, Kings Point, Valencia Lakes, Riverview, and Wimauma, the best place to be seen is in the pages of this community’s premier community news publications, The News of Sun City Center & South County. Fill out this form to request your customized ad quote today.